Sleaford 1st XI v Spalding. Louis Kimber batting for Sleaford. Sleaford CC suffered a surprise 43-run defeat to Readers Lincolnshire ECB Premier League basement side Spalding on Saturday... despite Johnny Cheer hitting a century. Spalding recorded their first victory of the season at London Road after posting 236-6. Thomas Shorthouse led the way with the ball for Sleaford, claiming three victims. However, the hosts were dismissed for 193. Cheer’s 115 was the top score, with support coming from Shorthouse (19) and Andy Hibberd (15). Sleaford currently sit in eighth place and host seventh-placed Skegness onb Saturday. In the South Lincolnshire & Border League Premier Division, Sleaford Seconds moved into third place, beating Stamford Town by five wickets, Michael Shelley taking six for 52 and Simon Godby hitting an unbeaten 78. Stamford were dismissed for 168, Sleaford responding with 169-5. 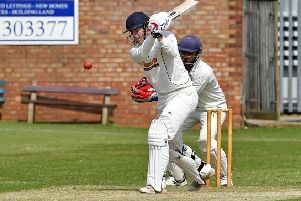 Billingborough stay fourth despite going down to Lindum Ramblers, for whom Joel Waller hit 53 and Harry Wells took six wickets. For Billingborough, Shaun Brown made 55. Ramblers’ score of 170-8 was too much for Billingborough, who were dismissed for 122. In Division One, Long Sutton Second ended just 10 runs short of Heckington’s 145-9, James Wilson taking six wickets for Heckington. Tom Poole made 76 and Mick Troops 56 as Boston Seconds finished on 224 all out against Billingborough Seconds, who were then bowled out for 68, Paul Deans taking five wickets for seven runs.